Captain Andras Davidhazy was born in Nemesocsa, Hungary, on April 1, 1911. Studied Mining Engineering for 3 years but when through the help of Admiral Miklos Horthy, the regent/governor of Hungary during the 1920-1944 period, he obtained a chance to go to sea, in 1932, he left University and enrolled as an apprentice seaman in one of the Hungarian vessels plying the Black Sea trade routes. In 1938 he graduated, 3rd in his class, from the Hungarian Marine Officers Academy and for the next 3 years sailed on various ships in steadily progressive officer ranks until, in 1941, he received his Captain's papers. In December 1944 he commanded 3 ships in a trip from Budapest to Deggensburg, Germany, to prevent their falling into Soviet hands and being taken from Hungary as war booty. In 1947, when the ships finally returned to Hungary, he did not return with them as he was warned by his supervisor (who was subsequently hanged on some trumped up political charges) that he would face prosecution for the "stealing" of the three ships. After a brief stay in Germany, Holland and Italy, together with his wife and two small sons, he emigrated to Argentina in October 1948. He worked there for various shipyards as draftsman, chief designer and technical director - as well as designing several small sailing boats/yachts as a sideline- until 1957 when he obtained a position as Draftsman at the well known yacht design firm of John G Alden, in Boston,Mass. He then emigrated to the States and stayed in Boston, where his daughter Minka was born in 1957, until 1961, when he received an attractive offer to work as Draftsman/designer with Nickum and Sons (later Nickum and Spaulding),this time not on yachts and small fishing vessels, but on major tankers, tugs, hydrofoil ships, etc. 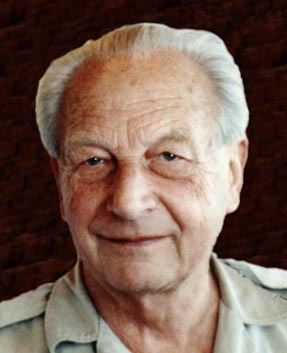 He retired in 1983 and returned to Budapest, Hungary, where he continued working until 1988 for the Hungarian firm Aluterv, designing various aluminium yachts, as well as free lance designing of several sailboats, including the "Equator", which was single-handedly sailed around the world by his friend Joseph Gal. During world War II, he received two iron cross medals (class I and II) for bravery and,in 1944, he was also inducted into the knightly order of VITEZ, normally awarded to persons who conducted themselves with unusual bravery under combat. In 1991, his "Najade" yacht design was awarded a 3rd prize in the International Boat Building Society's international competition. He was a member of the USA's Society of Small-Craft Designers. In 1993, he led the Hungarian Seamens' Association in their efforts in arranging for the return of the ashes of Admiral Horthy from Portugal to his family crypt in Kenders, Hungary, an achievement for which, in the year 2000, he was awarded the Distinguished Honorary Citizenship of the town of Kenders. Capt. Andy, as he was known by his friends, died in Budapest on April 7, 2003 when his heart stopped while he was waiting, in relatively excellent shape, for a new pacemaker implantation. He will be buried in Kenderes on April 18th, with his grave being adjacent and facing the Horthy family crypt, just a few feet from the final resting place of Admiral Horthy. Capt. Andy is survived by his 3 children 7 grandchildren, 2 great grandchildren, several nieces, nephews and their children/grandchildren,plus numerous friends throughout the world, including many in Seattle who fondly remember his cheerful attitude, his love of life (and Sophia Loren), his youthful spirit, his accordion, his Tetu and Heritage sailboats, and the numerous stories that he shared with all and to the enjoyment of everyone. Capt. Andy was special to all who knew him. We all miss him.